In 2011 my husband was diagnosed with end-stage renal failure and was told he needed a kidney transplant. This web-site is to keep the communication flowing for friends, family on Jon's transplant status, fund-raising events. As well to educate the community about kidney disease. THE ROAD TO RECOVERY CANNOT BE DONE ALONE! Jon is 6 months post transplant, and is doing very good. He's worked closely with his doctors to get his medication dialed in. He currently does a monthly infusion for 1 of his anti-rejection medicines. Jon has been able to return to work, and has started to visit the gym on a regular basis. Taking care of this precious gift is critical. The 2nd Annual Golf Tournament is September 21st. Visit the Events page for more information. On January 22nd Jon & his donor Bethany went into the hospital for the kidney transplant surgery! Each endured a 3 hour surgery and the transplant ended in success!!! Thanks to all the medical staff at Tampa General Hospital for all their care and attention! 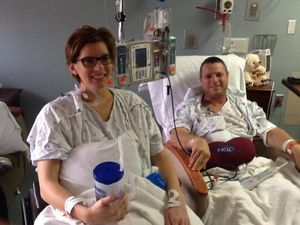 Jon & Bethany are in recovery but are both doing great! Early results show the new kidney is doing great in it's new home! Jon will be like a newborn baby for the first couple weeks, where we will be keeping him away from large crowds & sick people. Rest and more rest are his orders at this time. Well 2013 ended with some great news! Jon has a living donor!!! A very selfless and generous individual stepped up to get tested and she was identified to be a match for Jon! She's gone through a great amount of testing, and was approved by the transplant board right before Thanksgiving. They are currently scheduled for surgery on Wed January 22nd 2014! Both Jon & Bethany are working hard to stay healthy during this flu & cold season. We are preparing ourselves for this next path of our journey, including recovery and more fund-raising to help with the medical costs not covered by insurance. Check our event page out for updates on the 2014 Race!! 9/27/2013- The Inaugural Golf Tournament was a HUGE success. Thank you to all our participants, and sponsors. Without all of you we would not have been able to make another $5,000 donation to Jon's transplant fund. Since earlier this summer Jon has started dialysis. He's doing Peritoneal Dialysis which is done in our home, during the night while he sleeps. This type of dialysis allows Jon to continue to work full time. We are taking each change and step in this journey together knowing that there will be a better tomorrow after he received his new kidney. There's no update on a donor. At this time we are about half-way through the wait period for a deceased donor, and half way through the wait period to be possible matched through the shared donor program where I'd donate my kidney to someone of A-blood type and someone they know would give Jon their kidney. 6/24/2013 - Announcement: An Inaugural Golf Tournament is planned for Sunday, September 22nd at the Countryside Country Club. See our events page for more details. 6/14/2013 - The search for a living donor continues, and at the same time we are continueing to manage Jon's health. Summer is harder on him as the heat dehydrates him much faster, which leads to him being tired, but we are keeping our spirits up and allowing him to take naps on the weekends! 4/30/2013 - Race Results and Photos are now available. For every photo that is purchased as a print Boone's Pro Events will donate $1 back to Help Hope Live for Jon. For every photo that is purchased as a download they will donate $0.25 back to the fund. Enjoy the photos and can't wait till the next event! 4/28/2013 - Well yesterday marked the first annual Help Hope Live 5K, and I am proud to say we had 135 participants! It was amazing to see all the support we received from the community. With participants, volunteers, sponsors and donors we were able to raise a Net amount of $6,400 towards Jon's Kidney Transplant fund!!!!! I thank everyone! 4/6/2013- There is 3 more weeks before the first annual Help Hope Live 5K don't delay register today and bring your friends. I promise it's going to be a great event. Thank you to all our sponsors who without your support this event would not be possible - Clearwater Window and Door, Wells Fargo Advisor- Chad Spencer, Precious People Learning Center, Cool Wizard, Brightway Insurance Agent - Mike Hatmaker, Quality Inn Tarpon Springs, DJ Boone's Professional Entertainment. 2/18/2013 - The road to a kidney translant is full of twists and turns. 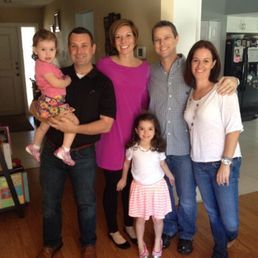 This weekend Jon's case took a new turn, related to a living donor. A friend of ours had made the selfless offer to undergo testing to see if she could be a donor to Jon. Unfortunately after numerous tests, the transplant board at Life Link Tampa determined she is not a compatible donor for Jon. Jon remains on the UNOS list for a Kidney, but with O blood type the standard wait time is 2 1/2 - 3 years. A living donor is a better option for Jon's case. If you or anyone you know has ever considered being a living donor and have O blood type (+/- doesn't matter) please feel free to message us. The process begins with a phone consult and blood test.